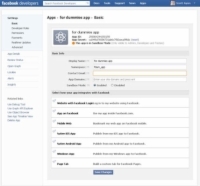 The first step to building your own app is to set up your app inside Facebook’s app builder. 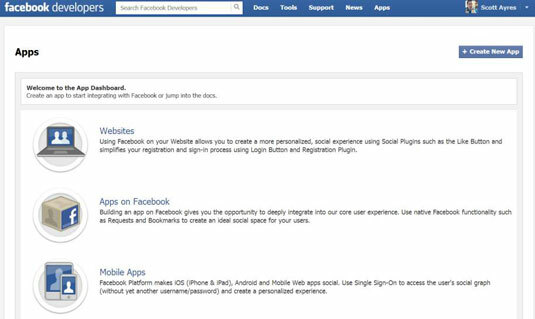 You take this step to become a developer on Facebook and to have a place to find all your apps. 1Go to Facebook’s app builder. An authorization screen appears. You need to allow the app to access basic information on your timeline to use it. This is all that’s required to have developer capabilities with Facebook. After you complete the authentication, you see the apps page. The first time you go to the apps page, you see a blank screen and the Create New App button. 3Click the Create New App button. The Create New App dialog box appears, asking you to name the app. 4In the App Name text box, type what you want the app to be called. In the App Namespace text box, type what you want to appear at the end of the app’s URL. You can name your app whatever you want, but note that the namespace can’t have uppercase letters or symbols. 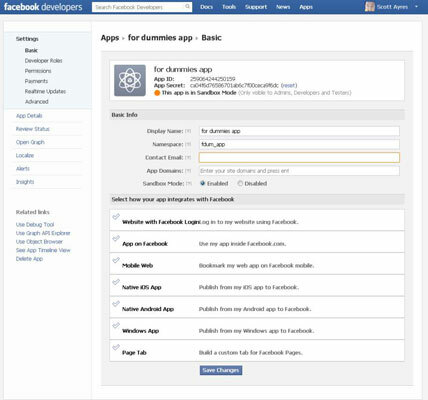 For example, if you type fordummies in the App Namespace text box, your app’s URL will be http://apps.facebook.com/fordummies. Leave the other fields blank, and your app will be fine. If Facebook needs any more verifying info here, they will ask for it. For instance, you may have to enter a series of letters and numbers to prove that you’re human (called a CAPTCHA). For most people, however, your app is created. You just created your core app! You’re now on the configuration screen of your brand-new app.